Aerial view of experimental plots near Toolik Lake, Alaska. ​The Arctic is warming faster than any other biome on the planet, which underscores the critical importance of understanding the influence of warming on ecosystem processes in this region. In particular, arctic warming could increase microbially-mediated decomposition of the vast amounts of carbon stored in permafrost soils. Increased decomposition would result in higher levels of atmospheric carbon dioxide and methane, which are heat-trapping pollutant gases that endanger public health and welfare, and potentially create positive feedbacks to climate change. 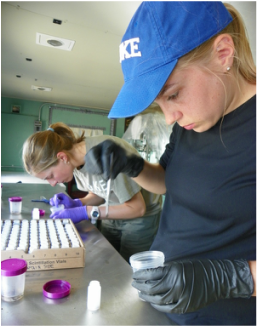 Decomposition rates are strongly determined by microbial community composition, and consequently, numerous studies have addressed the effects of climate change in the Arctic by focusing on microbial responses to warmer temperatures and greater resource availability (e.g. due to deeper permafrost thaw). 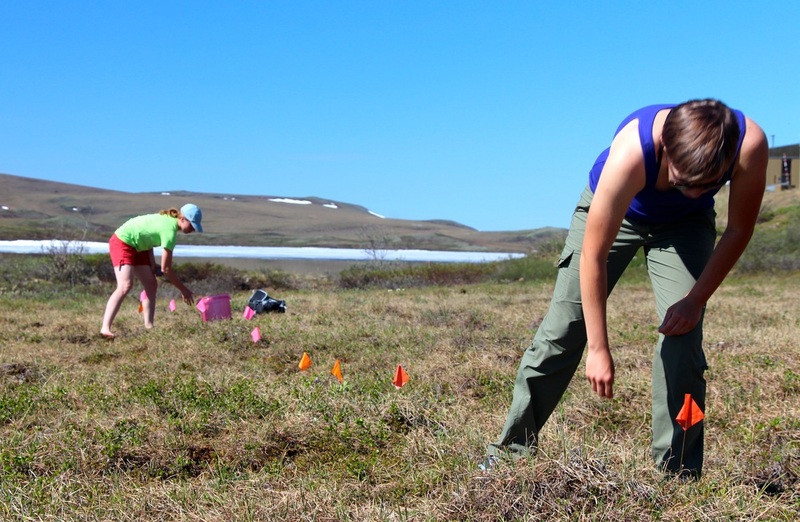 Although we know that the composition and activity of the microbial community can be modified by micro- and macro- invertebrates in the soil, and that soil invertebrates themselves are regulated by generalist predators like spiders, it's unclear how microbial responses to warming in the arctic are being affected by the broader food web. Generalist-feeding spiders are among the most important predators in terrestrial systems, and their behavior has been shown to indirectly influence plant community composition, diversity, and productivity; nutrient cycling; and decomposition. Potential shifts in spider feeding ecology as a result of climate change could therefore have important and far-reaching consequences for arctic community dynamics and ecosystem processes. 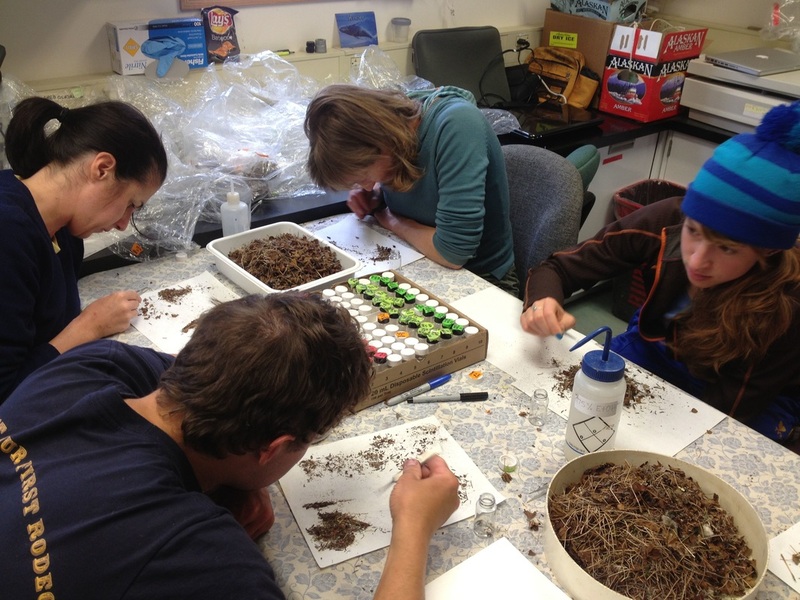 Results from this project will provide insight into the extent to which arctic wolf spiders influence the structure and function of soil food webs and whether their impact on the community is changing with warming. Wolf spiders are among the most abundant arthropods -- and animals in general -- on the tundra, and we know that they are already responding to the warmer temperatures and longer growing seasons brought on by climate change. This area of my research program is focused on understanding variation in wolf spider density and predation pressure across the landscape in order to identify where and under what conditions wolf spiders may have the strongest influence on belowground processes (e.g. soil community structure and function). 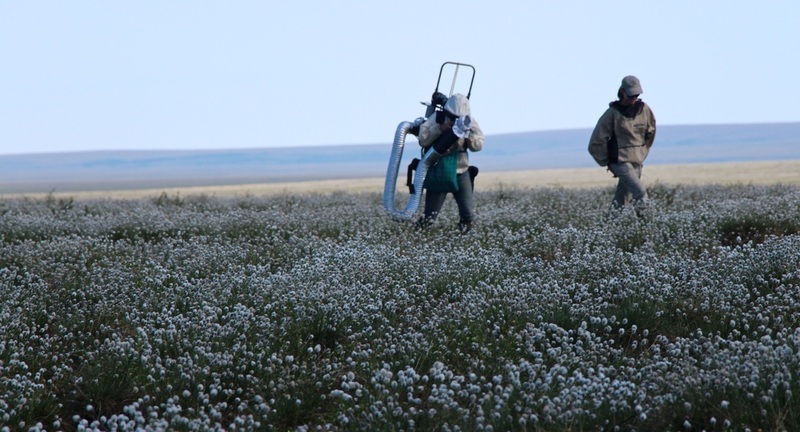 Several other ongoing projects address how entire arthropod communities are responding to changing conditions in the Arctic. Hard at work sorting vacuum samples!